The Atlanta BeltLine is a dynamic and transformative project. Through the development of a new transit system, multi-use trails, greenspace, and affordable workforce housing along a 22-mile loop of historic rail lines that encircle the urban core, the Atlanta BeltLine will better connect our neighborhoods, improve our travel and mobility, spur economic development, and elevate the overall quality of life in the city. 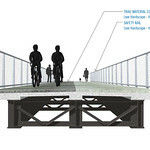 Some of the most rewarding details about the Atlanta BeltLine project are on this page! We have tangible progress notes dating back to 1999, when the idea for the Atlanta BeltLine was just that – ‘an idea!’ The ins and outs of how it became a reality begin with the project’s infancy as a graduate student’s thesis, and move into the detailed strides our city officials and many very devoted activists took to bring it to life. Take time to review how far we’ve come, and celebrate new milestones with us as our journey continues! A major milestone was accomplished in 2016 – voters passed two historic referenda. The City of Atlanta will collect an additional ½ penny sales tax in funding for MARTA and transit expansion and an additional 4/10 penny sales tax on the dollar in funding for transportation improvements (TSPLOST). These funds will help expand and improve the overall transit & transportation system in Atlanta, including some Atlanta BeltLine projects. In 2016, two new affordable housing developments were completed: Reynoldstown Senior, which includes 70 units of affordable senior housing in southeast Atlanta, and Stanton Oaks, a redevelopment of 43 units of affordable housing in Peoplestown (formerly Boynton Village.) To date, 560 units of affordable housing have been supported in the Atlanta BeltLine Planning Area, and going forward, $15-20 million of Tax Allocation District revenue will go to support more affordable housing. We expect 265 units of affordable housing to be under construction in 2017, with a funding commitment of $18 million over the next three years to address issues of affordability and equity. Work also advanced on the study of Murphy Crossing development potential, which will activate the 16-acre site on the Westside Trail. Construction continued on the Westside Trail, with pouring of the first segments of concrete in the last few months of 2016. The Eastside Trail extension – from Irwin Street south to Kirkwood – kicked off construction in 2016. By the end of the year, the path under the Krog Street Tunnel had been completed, and most of the preliminary work on Wylie Street is finished. In July 2016, the Board of Directors named Rob Brawner the Partnership’s new Executive Director. In 2015, Stanton Oaks, formerly Boynton Village, was renovated as part of the Atlanta BeltLine’s affordable workforce housing program, and the Federal Home Loan Bank of Atlanta and Atlanta BeltLine, Inc. launched a partnership to fund housing initiatives on the Atlanta BeltLine. Ground was broken on Reynoldstown Senior, an affordable housing development. The Design Review Committee launched and began review of projects in the plannning area. Senate Bill 4 was signed into law, paving the way for public-private partnerships to fund transportation. The PATH Foundation completed on a spur trail connecting the Northside Trail to the Bitsy Grant Tennis Center. The revised Atlanta BeltLine/Atlanta Streetcar System was adopted by City Council in December. The second skatepark on the Atlanta BeltLine opened at Arthur Langford, Jr. Park. The 3-mile Westside Trail broke ground in November. The Gateway Trail, a connection between Historic Fourth Ward Park and the Eastside Trail, went into construction and opened within the year. The reconstruction of the Edgewood Avenue bridge over the Eastside Trail was completed in April. 16 miles of the Atlanta Streetcar expansion entered into the next planning phase. The fifth annual Art on the Atlanta BeltLine exhibition took place from September to November. The kick-off event, the Atlanta BeltLine Lantern Parade, drew over 23,000 revelers to the Eastside Trail. Over the summer, we debuted our Atlanta BeltLine smartphone app, downloadable from the Apple App Store or Google Play Store. The Atlanta BeltLine won our first ever international award, the prestigious Prix d’Excellence from the International Real Estate Federation (FIABCI), for the best rehabilitation project in the world. The Atlanta BeltLine’s Workforce Partnership in Healthcare received recognition from the White House as one of 35 model programs from across the country during the signing of the Workforce Innovation and Opportunity Act. The Southern Charm Etiquette Campaign launched to gently remind people of the courteous rules of the trail. The new ADA-accessible, CNG powered bus for Atlanta BeltLine Partnership’s tour program hit the road. Read a full recap of 2014 here or download Atlanta BeltLine, Inc.’s 2014 annual report. The Atlanta Police Department introduced its new Path Force Unit, dedicated to the patrol of open Atlanta BeltLine parks, trails, and adjacent neighborhoods. The 15-officer Path Force took up their new headquarters in the ground floor of the Lofts at Reynoldstown Crossing. The Atlanta BeltLine and partners both broke ground on and completed the Southwest Connector Spur Trail in the Beecher Hills neighborhood of southwest Atlanta. The spur trail will eventually connect the Beecher Hills and Westwood neighborhoods with the Atlanta BeltLine. The City of Atlanta was awarded an $18 million TIGER V grant to develop the Westside Trail from Lena Street to University Avenue. The fourth and largest Art on the Atlanta BeltLine exhibition to date commenced in September with the annual Lantern Parade, bringing over 10,000 participants onto the Eastside Trail. Volunteers planted the first fruit trees at the Urban Agriculture site, and preparation laid the groundwork for construction of the farm in 2014. In late 2013, Atlanta BeltLine, Inc.’s Board of Directors adopted the Strategic Implementation Plan, outlining the next 17 years for completion of the entire Atlanta BeltLine program. The Active Lifestyle Competition kicked off and free fitness events were organized in 2013 with the goal of promoting healthy lifestyles on the Atlanta BeltLine. The Workforce Partnership program launched as a collaborative effort to provide hiring and training, reduce employee turnover, and ensure that Atlanta BeltLine residents have requisite job skills and access to economic opportunities. 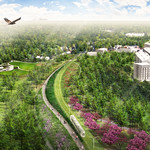 The final subarea is approved by Atlanta City Council, concluding the master planning process for the Atlanta BeltLine. Construction began on the Atlanta Streetcar project, which will eventually connect to the Atlanta BeltLine. Progress on the Eastside Trail continues with major construction activities with completion scheduled for the summer. The Atlanta BeltLine hosted its first ever Business Opportunity Forums in partnership with Georgia Minority Supplier Development Council, the Atlanta Business League, the Urban League of greater Atlanta and the Greater Women’s Business Council. The Forum provided information about the projects and procurement process for Transportation Referendum initiatives in the region for majority and minority firms. The Atlanta BeltLine began the public input process to develop an Environmental Justice Policy. ABI held its second annual Organic Land Care Symposium. The Atlanta BeltLine Partnership’s Running Series kicked off the first Atlanta BeltLine Run Club with more than 70 runners coming out for a fun run/walk through the neighborhoods along the Eastside Trail. Two sections of the Right of Way (ROW) totaling 3.5 miles of Atlanta BeltLine corridor in the southwest and southeast were secured through long term leases and purchase options with the Georgia Department of Transportation. Grand openings were held for three parks. 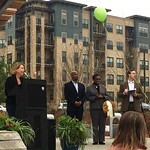 D.H. Stanton Park re-opened to the public as an eight-acre park on the Atlanta BeltLine corridor in southwest Atlanta. This is the City of Atlanta’s first energy cost-neutral park and one of the first in the nation. Mayor Kasim Reed officially dedicated Historic Fourth Ward Park at the section containing the 12 acres bordered by North Avenue and Ralph McGill Boulevard. Atlanta’s first public skatepark opened with the Historic Fourth Ward Skatepark and a special visit from professional skateboarder Tony Hawk. Boulevard Crossing Park Phase I, with its two playing fields, opened in southeast Atlanta with members of the community and the Atlanta Silverbacks professional soccer team. The Atlanta Regional Roundtable included segments of the Atlanta BeltLine and new direct transit connections into midtown and downtown on the final project list of the Transportation Investment Act (TIA). If the TIA is approved by voters on July 31, 2012, these projects will $602 million in funding. Atlanta BeltLine, Inc. acquired the former “Triumph Lofts” development from a receivership to provide 28 critically-needed affordable for-sale homes. The development, renamed as “Lofts at Reynoldstown Crossing,” is located at the intersection of Chester Avenue, Memorial Drive and the Atlanta BeltLine corridor. A one-day sale event was held in December which featured a drawing of qualified buyers making under $68,000 – the Atlanta area median income. Overall, the Atlanta BeltLine created 46 affordable homes throughout the corridor in 2011. The Atlanta BeltLine hosted its first annual Organic Land Care Symposium, aimed to educate individuals about utilizing organic and sustainable approaches to the management of public and private spaces. The second Annual Art on the Atlanta BeltLine exhibition opened. The Atlanta BeltLine Partnership Running Series hosted the Northside 5k, Southwest 5k, and Northeast 10k. Jamestown Properties purchased the City Hall East building for $27 million and announced its plans to spend $180 redeveloping it into “Ponce City Market,” a mixed use business and residential property directly on the Atlanta BeltLine. A kick-off party for this massive redevelopment project, “Party on Ponce,” featuring performances by the Indigo Girls, Shawn Mullins, and Francine Reed as well as local chefs raised more than $80,000 for the Atlanta BeltLine Partnership and Georgia Organics. The Atlanta BeltLine’s Greenspace Job Training program celebrated its first class of graduates in March 2010, and 100 percent of the trainees were placed in related jobs. The Northside Trail in Tanyard Creek Park opened to the public in April 2010. The multi-year Corridor Design process for the Atlanta BeltLine corridor began led by the firms Perkins+Will and Field Operations. Construction began on D.H. Stanton Park. Construction began on Boulevard Crossing Park. Construction began on Historic Fourth Ward Park Phase II. United States Department of Housing and Urban Development (HUD) Secretary Shaun Donovan toured the Atlanta BeltLine and announced a national affordable housing program in an Atlanta BeltLine neighborhood. The West End Trail Phase II opened to the public in June 2010. The Atlanta BeltLine Running Series hosted a 5k on the West End Trail. Atlanta BeltLine Community Benefit Guiding Principles, which will help shape development and amenities throughout the Atlanta BeltLine neighborhoods, were adopted by the Atlanta City Council in October 2010. Art on the BeltLine: Atlanta’s New Public Space, the first-ever temporary public art exhibition along the Atlanta BeltLine corridor, took place in the summer of 2010, showcasing more than 40 exhibitions. The exhibition season ended in October with the Atlanta BeltLine Lantern Parade. Ground was broken on the Eastside Trail Phase I in October 2010. 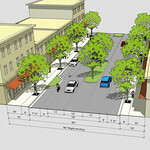 City Council adopted the Master Plans for Subareas 1 and 10. The Atlanta BeltLine Partnership along with the support of Park Pride and Atlanta BeltLine, Inc. launched the Adopt the Atlanta BeltLine program. The Atlanta BeltLine Affordable Housing Trust Fund was launched. City Council adopts the first five Subarea Master Plans (2, 3, 5, 7 and 9). Atlanta Public Schools reaffirmed its participation in and commitment to the Atlanta BeltLine TAD. MARTA and Atlanta BeltLine, Inc. advanced the Tier I Environmental Impact Statement, a critical process to secure federal transit funding. With the Atlanta BeltLine TAD Advisory Committee, Atlanta BeltLine, Inc. developed and adopted an equitable development plan as directed by City Council in preparation for the next Atlanta BeltLine TAD bond issuance and work plan. ABI entered an option agreement and a lease with GDOT for 3.5 miles of the Atlanta BeltLine corridor in the Southwest and Reynoldstown. Construction began on Historic Fourth Ward Park Phase I. The Atlanta BeltLine, Inc. Board of Directors named Brian Leary as President and Chief Executive Officer. 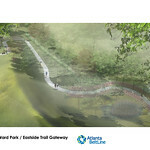 Design contracts are secured for four additional Atlanta BeltLine Parks. Led by the PATH Foundation, the first segment of the Atlanta BeltLine West End trail opened – enhanced by Trees Atlanta’s Atlanta BeltLine arboretum. MARTA and the Federal Transit Administration, in partnership with ABI, commenced the Environmental Impact Statement, a critical federal study to determine the alignment of transit and trails, assess impacts on the environment and make the project eligible for future federal funding. The Atlanta BeltLine Running Series hosted a 5k on the West End Trail (Phase 1). Ground was broken for Historic Fourth Ward Park. Including gifts from many of Atlanta’s leading corporations and foundations, The Atlanta BeltLine Partnership’s $60M capital campaign was 50 percent complete. First Atlanta BeltLine TAD Bonds were issued, totaling $64.5 million. The Atlanta BeltLine Affordable Housing Trust Fund was approved by City Council and initially capitalized with $8.8 million in TAD Bond proceeds. The Metropolitan Atlanta Rapid Transit Authority (MARTA) approved the 22-mile loop of the Atlanta BeltLine and a light rail mode of transit as its Locally Preferred Alternative, a critical early step in securing federal funding. Master planning and community engagement commenced, consistent with the Citizen Participation Framework adopted by City Council. Atlanta BeltLine was awarded $300 thousand in Federal Transit Administration funding to further support initial design and engineering. The northeast corridor became the first segment of the Atlanta BeltLine transit corridor to be acquired for the Atlanta BeltLine. Twenty-one acres were assembled in Southeast Atlanta for development of a new Atlanta BeltLine park located at Boulevard Crossing. The Atlanta BeltLine’s first Public Opinion Poll of 600 City residents showed overwhelming majority believe the project will be completed as envisioned. The Atlanta BeltLine Partnership launched public tours through the 45 neighborhoods along the Atlanta BeltLine. The Atlanta BeltLine Affordable Housing Advisory Board (BAHAB) was established. The Five Year Work Plan was created with extensive pro bono assistance from a senior Boston Consulting Group team, Invest Atlanta, and the Atlanta BeltLine Partnership. The Work Plan was formed by input from more than 10,000 community members and outlined the priorities, goals, organizational structure, and a $427 million budget for the first five years of the Atlanta BeltLine project. It was approved by Atlanta City Council in July 2006, and the stage was set for implementation of this visionary project. The City of Atlanta purchased the Bellwood Quarry from Vulcan Materials Company under the leadership of the Mayor and City Council with the involvement of Ray Weeks and other key leaders. The quarry will feature a reservoir providing critical drinking water for the city as part of a 300-acre greenspace, which will be one of the largest parks in the City. To oversee implementation of the Atlanta BeltLine, including coordination with City of Atlanta departments and ongoing community engagement, Invest Atlanta authorized the creation of Atlanta BeltLine, Inc. Under the leadership of President and CEO Terri Montague and Board Chairman Cal Darden, Atlanta BeltLine, Inc. commenced operations. The Atlanta BeltLine Tax Allocation District Advisory Committee (TADAC) was formalized. The Atlanta BeltLine Partnership hired Valarie Wilson to serve as Executive Director. The Partnership began its focus on securing private funding for the Atlanta BeltLine, raising general awareness and broad-based support for the project, and mobilizing resources to address social concerns raised by new development around the Atlanta BeltLine. The Atlanta BeltLine Partnership’s $60 million capital campaign is launched. Additional Atlanta BeltLine park land was acquired to expand Peoplestown Park and the future Westside Reservoir Park at Bellwood Quarry. The Atlanta BeltLine Network, an alliance of organizations with an interest in the planning, development and maintenance of the Atlanta BeltLine, was formed. Atlanta Mayor Shirley Franklin created the Atlanta BeltLine Partnership to galvanize private sector and citizen support for Invest Atlanta’s (formerly The Atlanta Development Authority) BeltLine efforts. Ray Weeks, a veteran civic and business leader, is selected to chair the Atlanta BeltLine Partnership. The Atlanta BeltLine Redevelopment Plan and the BeltLine TAD are approved by the Atlanta City Council, Fulton County Board of Commissioners, and the Atlanta Public School Board of Education following a 6-month process of community input. The Trust for Public Land’s Emerald Necklace Study by Alexander Garvin outlined an achievable, connected, park, trail and transit system along the BeltLine. Atlanta Mayor Shirley Franklin commissioned a study to determine the feasibility of funding the Atlanta BeltLine with a Tax Allocation District (TAD). Led by the Atlanta BeltLine Tax Allocation District Steering Committee chaired by Carl Patton and Barney Simms, the study found that revenue generated from an Atlanta BeltLine TAD would cover approximately 60 percent of estimated project costs – without requiring a tax increase. The Metropolitan Atlanta Rapid Transit Authority’s (MARTA) Inner Core Feasibility Study, examined several transit options for the City of Atlanta and recommended the Atlanta BeltLine for inclusion in its future Alternatives Analysis Study. Under the leadership of Ryan Gravel and Cathy Woolard, Friends of the BeltLine began to build grassroots support, meeting with neighborhoods across the city. 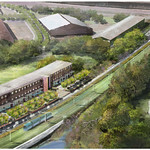 Ryan Gravel’s joint master’s thesis in Architecture and City Planning from Georgia Tech in 1999 was the original vision for the ambitious Atlanta BeltLine – a 22-mile transit greenway that transforms old railroad corridors with light-rail transit, parks and multi-use trails to generate economic growth and protect quality-of-life in 45 historic neighborhoods throughout the central city. In 2004 Alex Garvin published “The BeltLine Emerald Necklace: Atlanta’s New Public Realm”. The Beltline Emerald Necklace is a public realm framework around which 21st Century Atlanta will grow and prosper. The Atlanta BeltLine is many things to many people. It is a system of rails, trails, and greenspace that will seamlessly connect 45 neighborhoods, while also providing first and last mile transit connectivity for the entire metro Atlanta region. Because it is comprised of many different elements, it is important to have numerous maps and renderings to illustrate these various components, individually and collectively. These handy guides show cross-streets, access points, and connections to PATH trails. These maps are excerpts – visit full subarea master plans. Tax Allocation District (TAD) Map Detailed map outlining the Tax Allocation District. Atlanta has a rich history dating back before the Civil War, and it has undergone many changes in that time. Neighborhoods all around the city have blossomed, matured, and evolved, and together they have woven a patchwork dynamic that reflects the many different evolutions of the city. Some neighborhoods have continued to prosper with time, while others have fallen into disrepair. New development, new roads, and new realities have altered some neighborhoods, while others have remained virtually unchanged for decades. Obstacles, both natural and manmade, have created barriers separating many of these neighborhoods, and the result is a curious hodgepodge lacking a common thread — until now. The Atlanta BeltLine is changing the core dynamic of our city, bringing all of these disparate neighborhoods together under one vision that will transform these separate entities into one cohesive community, while still maintaining the individual character of each. The Atlanta BeltLine offers an opportunity to bridge gaps (literal and figurative), and unite the City of Atlanta in a way never before possible. We are enormously proud of the many accomplishments associated with the Atlanta BeltLine. Every new trail, park, special event, and program is a testament to the power of this transformative project and the people involved in making it happen. The fact that we get some hardware for the mantle is the cherry on top! Achieving milestones could not happen without team work. Atlanta BeltLine, Inc. is grateful to all who help achieve our mission. Read more about awards won. The world is watching our progress, and I am confident that we will demonstrate that the Atlanta BeltLine is the new gold standard for urban redevelopment projects. The Atlanta BeltLine has received numerous awards for its visionary approach to one of the most ambitious and wide-ranging urban redevelopment and mobility projects in the country. Read more about awards won. The Atlanta BeltLine is for everyone to enjoy, safely and securely. These are some of the resources in place to ensure a great experience for all. The Path Force Unit – that is responsible for providing public safety to the Atlanta BeltLine and adjacent parks and neighborhoods. The APD Path Force and AFRD Mobile Medics are making a difference on the Atlanta BeltLine. The Atlanta Police Department has a dedicated unit – the Path Force Unit – that is responsible for providing public safety to the Atlanta BeltLine and adjacent parks and neighborhoods. Launched in the summer of 2013 with funding from the U.S. Department of Justice, the Path Force patrols seven days a week. The unit is comprised of 15 officers and three supervisors, all of whom are military veterans. Their presence is a mainstay on the Atlanta BeltLine – if you see them, say hi! Access points, security cameras, mile markers and lighting are all features to enrich the user experience and enhance public safety. Security cameras on the Eastside Trail feed into the Atlanta Police Department’s citywide Video Integration Center, and mile markers are in place along all Atlanta BeltLine trails – both permanent paved sections and interim hiking trails. These markers are tied into the 911 system so first responders will know exactly where to go in the event of an emergency. Lighting along trails and under bridges is available in several locations and will be incorporated into all future trail sections. Routine maintenance issues can pose a safety hazard if not addressed. For these issues, Atlanta BeltLine has a fix-it line that we encourage users to dial when they see graffiti, landscaping problems, or anything broken in the parks or on the trails. The fix-it line is 404.477.3687. You can also email photographs of issues to fixit@atlbeltlineorg.staging.wpengine.com. In case of emergencies, please call 911. Public safety is strongest when you – the public – are engaged. If you see suspicious activity or an emergency call 911. The Path Force Unit can be reached at 404-546-PATH (7284). 45 neighborhoods – one Atlanta BeltLine community. The Atlanta BeltLine is a tremendous project that is having an unprecedented impact on the City. With so many different facets and stages to the project, there is also a large amount of related studies, reports, and additional documents.